The properties of radioactivity and the concept of half-life determination can be difficult subjects for students to fully understand. Using simulated radioactive atoms, each student conducts a series of activities They calculate the amount of carbon 14 present in an insect embedded in amber for about 18,000 years and in charcoal burned approximately 28,000 years ago, then discover the age of pollen from the amount of carbon 14 left. 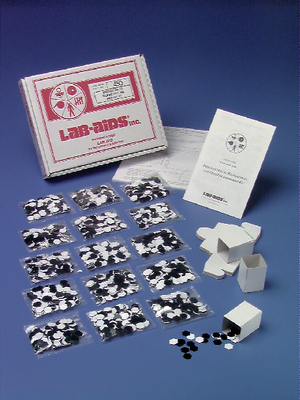 Includes 15 sets simulated plastic radioactive atoms (simulats), 15 shakers, 30 student worksheets and guides, and instruction manual.